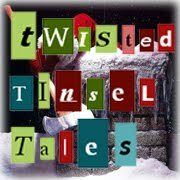 Welcome to today's instalment in Twisted Tinsel Tales! Over the course of the week I'll be putting a horrific / humorous twist on the season, featuring book reviews, interviews, top 13 lists, guest posts, and odd facts about the holiday. It's all very twisted and terrible, and definitely not traditional, but it's all in good fun. Please join us for a daily antidote to the sugary spiritual sweetness of the season, and enjoy a few guilty pleasures along the way. Credit (or, perhaps, blame) for the idea of artificial, indoor Christmas trees lies with the 'jolly' old Germans. As far back as the 1880s they originated the idea of an artificial holiday tree, made of wood, and covered in goose feathers that were dyed a bright green. Not to be outdone, the Americans debuted the first commercially made artificial tree in the 1930s. In a stroke of recycling genius, the Addis Brush Company rededicated their toilet brush weaving machinery to creating faux-pine branches that were less flammable than the alternative and able to support more decorations. No great surprise here, but the early pagans were actually the first to decorate Christmas trees. As part of their midwinter festival early Romans decorated trees with bits of metal a dozen candles to honour the sun god, while early Druids honoured Woden by tying fruit to tree branches and placing candles on the branches to honour their sun guard.